Clearly, the same conception guided the hands that built those cathedrals and the temples of Egypt. This dark abode of the dead corresponds, as we said there, to the region of Paradise, enclosed between the four Pillars of the World. 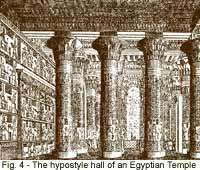 But the Egyptian Paradise, their land ancestral, was Punt, the Land of the Gods.